A fortune in diamonds is hidden in an ancient African temple. Our heroes, Nyoka, a woman raised by her father in the jungle, and Jack Stanton, a young pilot, must do battle against a gang of unscrupulous treasure hunters. The serial Jungle Girl is pretty good. It is, however, a bit of a let down. 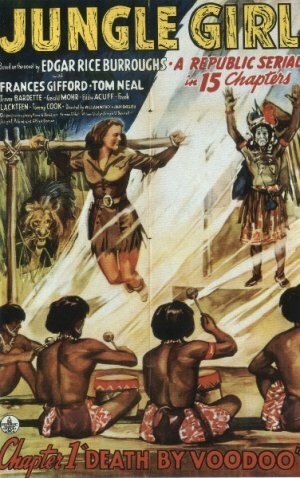 When you have a serial that proudly boasts to be based on an Edgar Rice Burroughs story, is directed by Witney and English, is referred to as “The best of all jungle serials” and, lets face it, is named, Jungle Girl – with chapter titles like, Death by Voodoo, River of Fire, and Jungle Vengeance – you expect something more than just pretty good. The Edgar Rice Burroughs story was first published as a five part series entitled, The Land of Hidden Men. It was then republished in book form under the sexier title Jungle Girl. Apparently in subsequent republishings it has gone back to its former title. The serial Jungle Girl had a shooting schedule of 45 days. When you consider that some serials were shot in under two weeks, 45 days seems almost excessive. Serial stories are always action based and very simple. You need to keep it simple so that if someone misses a few chapters they can pick up the story without any troubles. That being said, I guess I shouldn’t be surprised that Jungle Girl is no different. I was, however, fooled into believing that there might be more to this serial because of its claim to be based on a Rice Burroughs story. It turns out that the only similarity between this and its namesake is, well, the name. Which is a shame because I’ve read the plot summary of the novel and it sounds like it would have made an amazing serial, filled with warring tribes, chases, daring rescues, escapes, and plot twists. What we have is a story about bad guys trying to steal diamonds and good guys trying to stop them.